Inlays and Onlays are restorations that are used to rebuild a back tooth, a molar or premolar that has lost a significant amount of its structure due to decay or trauma. Similar to dental fillings, but rather than being directly placed into your tooth and then set, inlays and onlays are fabricated in our dental laboratory and then cemented into place. This is known as an ‘indirect procedure’. Inlays fit into the chewing surface of a tooth whereas onlays are designed to replace the chewing surface and one or more of the tooth cusps. These are the raised points on a tooth and can become chipped or damaged. Onlays are sometimes also called three-quarter crowns as they cover up more of a tooth than an inlay but unlike crowns, some natural tooth structure will still be visible. Our dentist will evaluate your tooth to see if it is suitable for an Inlay or Onlay and also decide which material is best. Porcelain and composite inlays and onlays are tooth coloured. Porcelain is harder wearing than composite and will not stain, but will cost a little more. 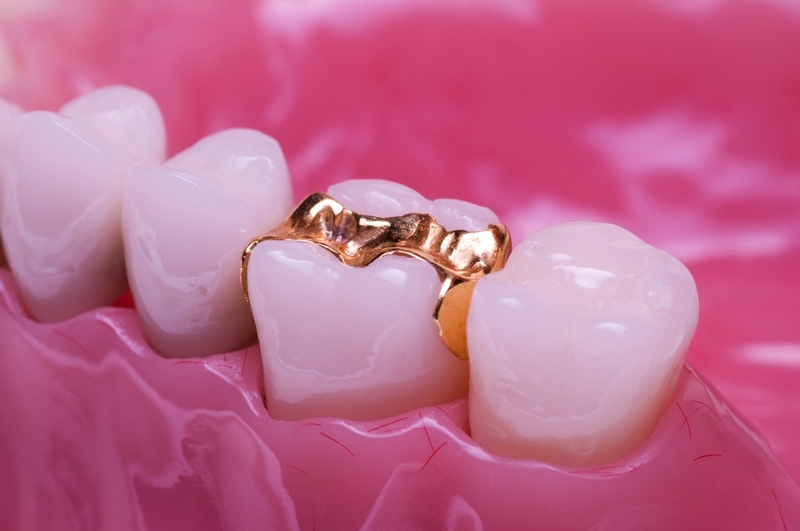 We might suggest you have a gold inlay or onlay if you have a very heavy bite or clench or grind your teeth. This is because although gold is hard-wearing, it is quite soft and will not damage your opposing teeth. Any decay that is present will be removed and the tooth surface is carefully shaped for the restoration. Special impression materials are used to record a highly detailed and accurate impression of your tooth. The impression material is placed into an impression tray which is then inserted into your mouth and left to set for a few minutes before being removed. An impression is also taken of your opposing teeth, so our technician can see how your teeth bite together. The impression is sent to our Dental Laboratory where our technicians will custom-make your Inlay or Onlay. This can take up to two weeks.